Bruges is really the most enchanting city of Belgium. The entire city is protected by UNESCO as cultural heritage of humanity. Your guide will take you on a walking tour along the most beautiful sites of the city: the beguinage, the Church of our Lady with Michelangelo’s Madonna, the canals, the Belfry Tower on the Market Square, the Burg Square with the Town Hall and the Church of the Holy Blood… There will be time for an optional but unforgettable canal tour. 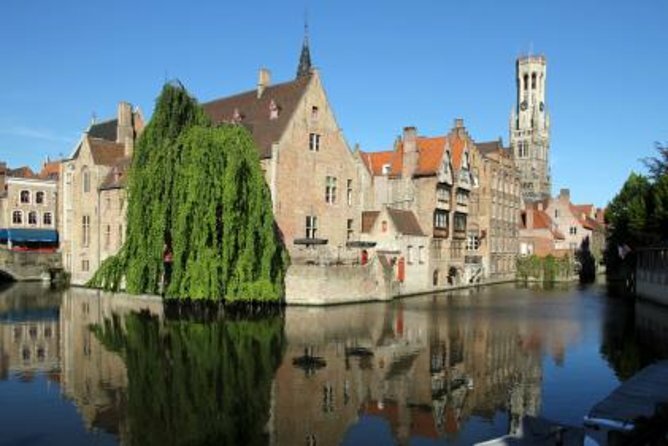 Guests who have some more time to spend in Belgium are advised to take, the separate discovery tours of Ghent and Bruges. In this way they can enjoy some extra leisure time in the two sister cities. The Basilica of the Holy Blood is a Roman Catholic basilica in Bruges, Belgium. The church houses a venerated relic of the Holy Blood allegedly collected by Joseph of Arimathea and brought from the Holy Land by Thierry of Alsace. The Church of Our Lady in Bruges, Belgium, dates mainly from the 13th, 14th and 15th centuries. Its tower, at 115.6 metres in height, remains the tallest structure in the city and the second tallest brickwork tower in the world. The Bruges City Hall is one of the oldest city halls in the entire Netherlands region. It is located in Burg Square, the area of the former fortified castle in the centre of Bruges. The famous area is called the "Lake of Love" and" Lovers bridge" . It’s a romantic place to be with someone you love! An amazing location within the confines of the city. The Burg Square is the political center of Bruges. It is a lovely place where architecture lovers can enjoy the amazing mix of beautiful buildings. The Princely Beguinage Ten Wijngaerde is the only preserved beguinage in the Belgian city of Bruges. There are no more Beguines living there, but since 1927 it functions as a convent for Benedictines, founded by canon Hoornaert. There will be time for an optional but unforgettable canal tour.